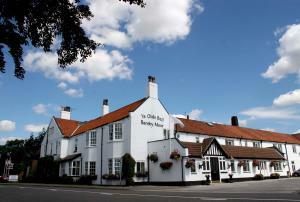 Choose from 63 hotels and guest houses in Nottinghamshire. Shown below a just a selection of the hotels available. To search within an area please use the menu on the right. You will be well looked after at Hylands with its clean, comfortable accommodation and warm, friendly atmosphere. 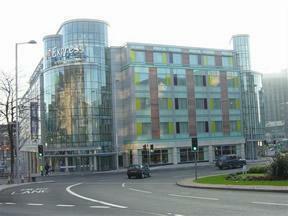 Bus and train links to the city centre are close to the hotel. Hylands is situated close to Nottingham University, Highfields Hockey Club, Nottingham Indoor Tennis Centre, Wollaton Park and Attenborough Nature Reserve. Within walking distance is an award-winning pub offering Real Ales and a large selection of wines and whiskies. Several excellent restaurants are also an easy walk away. Dating back some 100 years, this family-run B&B close to the town centre was once the home of monks from the nearby church. 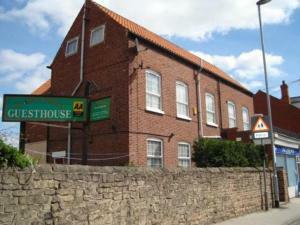 Near to beautiful countryside and the home of Robin Hood, the pleasant guest house accommodation is furnished to a high standard, and all rooms have en suite bathrooms. Described as 'a gem', the guest house comes with plenty of facilities including Freeview TV, and a large private car park with CCTV. In the Nottinghamshire village of Barnby Moor, this romantic 17th century coaching inn rose to fame and fortune in the days of stagecoaches and highwaymen. Today, Ye Olde Bell Hotel and Restaurant combines the finest traditions of a fully refurbished country house hotel in extensive grounds with modern comforts and facilities. The St Leger Bar and Bistro is at the heart of the hotel and offers guests an informal alternative to the elegant oak-panelled 1650 Restaurant. The hotel has long been one of the region's best-loved venues for conferences, meetings, banquets, weddings and celebrations of all kinds. 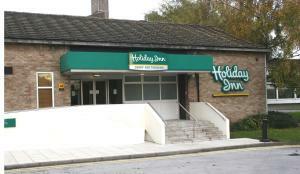 Conveniently located, the hotel has good access to the A1, M1 and M18. Doncaster, Leeds, Sheffield and Nottingham are all within an hour's drive. Robin Hood Airport is only 11 miles (18 km) away and Retford's main line train station is only a 10 minute drive from the hotel. 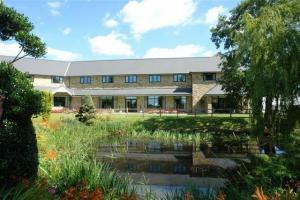 Set in beautiful gardens, this privately owned hotel offers an ideal choice for business or pleasure breaks. The hotel offers attractive bedrooms (upgrades available on request) an excellent restaurant with fine dining and a comfortable lounge bar open all day for food. 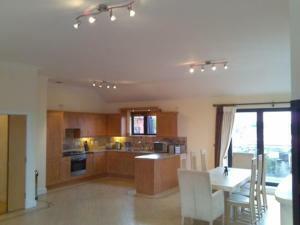 Easily accessible from the A1, M1 and M18 and only 10 miles from the new International Airport at Doncaster, this is an ideal base for discovering Robin Hood Country, The Dukeries, Clumber Park and Meadowhall. A warm welcome awaits. Nottingham's highest rated town house hotel, according to the AA Guide, this is a "Hip hotel with a heart". The hotel was recently awarded the Cond? Nast Johansens 25th Anniversary 2007 Award for Excellence. The Lace Market Hotel is Nottingham's premier small luxury town house hotel with just 42 individually designed bedrooms and an award-winning restaurant set in the heart of the city. Fresh, fully refurbished rooms, a contemporary setting and excellent customer service just 10 minutes from Nottingham city centre. The modern hotel comes with free on-site car parking and extensive on-site leisure facilities including an indoor heated swimming pool, jacuzzi, gymnasium, steam room and sauna. For business delegates, there are 11 versatile meeting rooms for 2 - 180 delegates. Enjoy a variety of dining options from ? la carte cuisine to bar snacks. Situated in the heart of the historic city of Nottingham, next to The National Ice Arena, this attractive new development consists of 52 bright, stylish and contemporary apartments. Consisting of one and 2 bedroom apartments, penthouses and duplex apartments, Premier Nottingham are ideal for both short and long term stays in the city - you can stay for one night, one week or longer, the choice is yours. 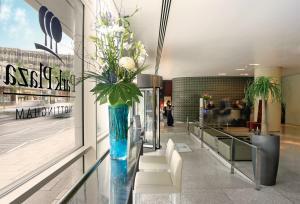 Shopping centres, restaurants, the Theatre Royal and the Royal Concert Hall are all within walking distance. Parking facilities are available on-site and a short 5-minute walk will bring you to the Railway Station and Nottingham Ring Road. Nottingham East Midlands Airport is also only 14 miles away. Set in the heart of Nottingham, just a short distance from the city's attractions and amenities, these one and 2-bedroom apartments provide short term accommodation to suit both business and leisure travellers. 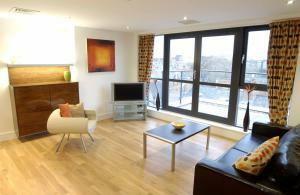 The apartments are set in mixed residential blocks, which gives both a warm welcome and a homely atmosphere. Each one provides the freedom of your own home with the luxury of a hotel suite, but at a fraction of the cost. Urban's staff are local to Nottingham and are here to help make your stay an enjoyable one, whether you are visiting on business or leisure. Less than a mile (1.6 km) from the city centre and Nottingham Railway Station, the hotel offers great value, with free parking and spacious, comfortable and modern en suite rooms. The Premier Inn Nottingham Castle Marina has a good location, within easy walking distance of all that the city has to offer, including the shops and bars of the city centre. All of the rooms have satellite TV, hairdryers, tea/coffee and telephone/modem points. Some rooms can take 2 adults and up to 2 children (under 16 years). The 2 children also get a free full breakfast when accompanied by an adult eating a full breakfast. An all-you-can-eat buffet breakfast is available each morning and includes the expected cooked items such as scrambled, fried, poached or boiled eggs, and pork or vegetarian sausages. There is also a wide continental selection. 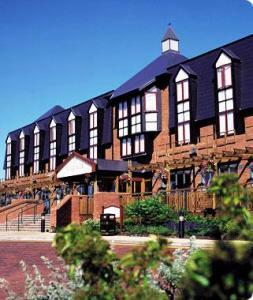 The on-site Beefeater restaurant serves freshly cooked char-grilled food. 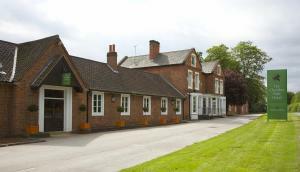 In a former royal hunting estate of King Charles II and Nell Gwynn, Bestwood Lodge Hotel is set in 700 acres of lush parkland, 4 miles from Nottingham city centre. Overlooking Bestwood Country Park, The Parkside Restaurant is a historic room, whilst the oak-panelled Foyer Bar is a relaxing place to enjoy a drink. Rooms are en suite and individually designed, with a TV and internet access. Guest will enjoy stunning views over the parkland. 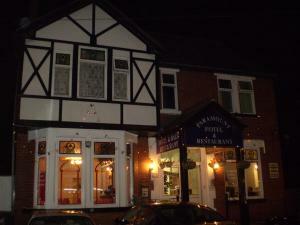 Bestwood Lodge Hotel boasts 7 meeting rooms and 2 of these rooms have a fully licensed bar. Local tourist attractions include The Tales of Robin Hood Museum, Nottingham Castle, The Caves of Nottingham and The Lace Market. 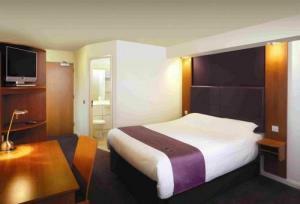 The Britannia Nottingham Hotel is in the heart of the busy and vibrant City of Nottingham. 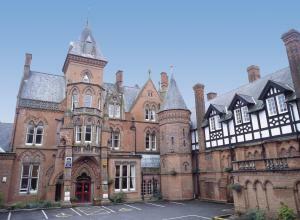 Adjacent to Nottingham Castle, it has a superb city centre location and is the perfect base for exploring Nottingham. 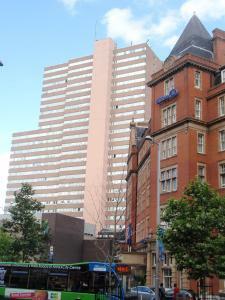 The Britannia Nottingham Hotel is the city's premier hotel. The hotel is situated near to Nottingham Castle, Trent Bridge Cricket Ground, Victoria Shopping Centre and the Nottingham City business district, proving an ideal location for both business and pleasure. Nottingham is also renowned for it's vibrant and popular nightlife. Quietly positioned in the city centre, the hotel is both modern and comfortable with 166 bedrooms, including 30 executive and non-smoking rooms, and a Suite. Roque Bar is a popular meeting place with Guests and locals alike, while Junction restaurant serves a fine selection of food, served throughout the day. The Britannia Nottingham Hotel has the best conference and dining facilities in Nottingham, with an abundance of facilities and vast public areas. 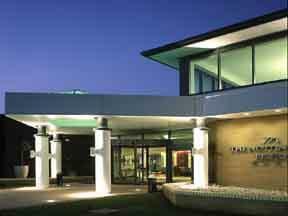 The Academy Business Centre incorporates extensive conference and banqueting facilities for up to 700 delegates and has its own entrance and reception. These 2-bedroom apartments have fantastic views over the city and the Market Square. 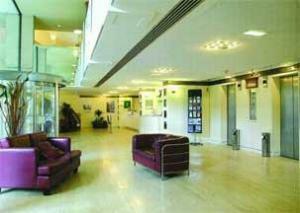 They have a superb location in Nottingham city centre, above the city's largest shopping centre. Each self-catering apartments is decorated in modern colours with laminate wood flooring. Each apartment has 2 double bedrooms; a large lounge with TV and DVD player; a kitchen; and a washing machine. Unlimited Wi-Fi is available at a small cost per day. 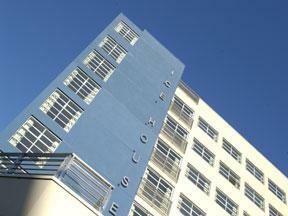 The building has an in-house 24-hour gym, a sauna and a swimming pool that can be used at an additional charge. Victoria Centre Apartments is minutes from the Theatre Royal, the Royal Concert Hall, the Lace Market and vibrant Hockley. Nottingham's tram system is a 3-minute walk away. Nottingham Trent University, the Cornerhouse Leisure Complex, the Trent FM Arena Concert Hall and Nottingham Ice Stadium are minutes away.